If seeing just Uluru from a helicopter wasn't enough!! Make sure you see it all while you are here on this once in a lifetime trip by combining the beauty of Uluru and Kata Tjuta in one unforgettable tour. This Tour by Professional Helicopter Services will showcase Kata Tjuta, which means ‘many heads’, a sacred place relating to knowledge that is considered very powerful. It is made up of a group of 36 conglomerate rock domes the highest of which stands 198 meters taller then Uluru and dates back 500 million years. With the wide spread of these domes and restrictions due to the sacred sites, mean that access from the ground is restricted to over 75% of Kata Tjuta. Ensure that you don't miss out on seeing the entire formation by taking a ride in one of our helicopters, combined with viewing Uluru we are sure you will be left with memorable memories and photographs that will last you a lifetime. Kata Tjuta, which means ‘many heads’, a sacred place relating to knowledge that is considered very powerful. It is made up of a group of 36 conglomerate rock domes the highest of which stands 198 meters taller then Uluru and dates back 500 million years. With the wide spread of these domes and restrictions due to the sacred sites, mean that access from the ground is restricted to over 75% of Kata Tjuta. 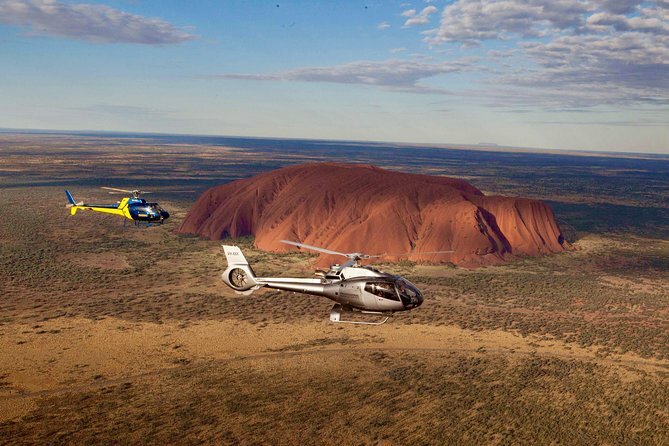 Ensure that you don't miss out on seeing the entire formation by taking a ride in one of our helicopters, combined with viewing Uluru we are sure you will be left with memorable memories and photographs that will last you a lifetime.